Historical significance: Jewellery didn’t always come endowed in gold or other precious metals. Ruins from Mohenjo-Daro excavations show that bangles were even made of copper, shell and terracotta. They were originally painted with black or red designs and were worn both by men and women. Over the years, it was believed that the use of bangles helps increase the blood circulation. The irreplaceable ‘choodiyan’ of Bollywood: Romance fills the air when it comes to Bollywood! And what better way to celebrate love than to depict it through the tinkle of the bangle? Making an entry with songs such as ‘Lelo churiyaan neeli-peeli laal-hari aasmaani’ (Saas Bhi Kabhi Bahu Thhi) celebrating a woman’s love for coloured glass bangles and ‘Jaanu jaanu ri kaahe khanke hai tora kangna’ (Insaan Jaag Utha) which celebrate bangles with ghungroo adornments attached. A more recent reference includes ‘Chittiyaan Kalaiyaan Ve’ where the protagonist is straightforward in asking for a range of jewellery not forgetting bangles. The list of popular numbers is endless ranging from Falguni Pathak’s Chudi khankayi re to Salman Khan serenading to the tunes of Bindiya Chamke and Chudi Khankayi Re, and Choodi Khanke with Shahrukh Khan and Juhi Chawla. In a country where a large population lives Bollywood, bangles are a direct reflection on the sense of fashion. Significance of colours: While one would usually see red bangles worn during the wedding ceremony, did you know that every colour worn at different points in time signify different things? For example red is worn at weddings to signify prosperity. Green on the other hand denotes good luck and fertility. Silver stands for strength, purple represents independence and gold is symbolic of prosperity and fortune. Traditional significance: Bangles hold a place of pride in wedding ceremonies of India. Very much like a mangalsutra which is an identity of a married woman, bangles hold a very significant place on the wedding day and beyond. The colour that is used differs from one community to another that denotes a different meaning. For example, amongst northern communities, a set of red and ivory bangles together is referred to as the chooda and calls for a very special ceremony. In the western regions, referred to as the ‘hirwachuda’ in Maharashtra, green bangles signify prosperity and are presented to woman on auspicious occasions such as a thread ceremony or a wedding. The raging college fashion trends: We are a country built on our youth, so how can we forget to mention the jewellery trends that sweep them by a storm? From statement gold coloured or brass bangles teamed with a bold ethnic look, to chunky metallic tones that go perfectly with any casual look, bangles are a teens best friend when it comes to variation in jewellery. 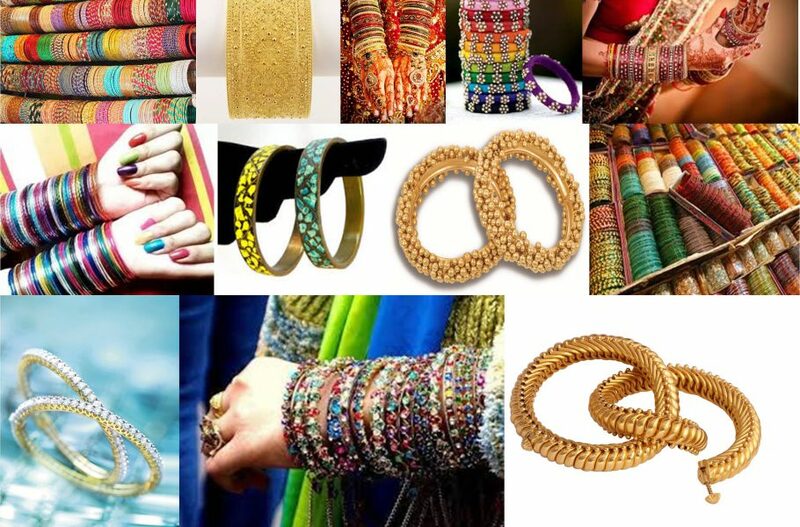 The trend has caught up so much that today you can also get bangles based on woodwork, silk threads, hand painted or decorated with a variety of embellishments. Bangles today: Today, we see different variations at weddings including the steady rise of French bangles and delicate 18k diamond bangles. While in India, gold bangles may have been a woman’s first love, platinum bangles are slowly growing to be a new favourite for its fluidity of timeless designs. With innovation at its peak, one can also choose to go for engraving messages or pick and choose variety of stones in the final design. 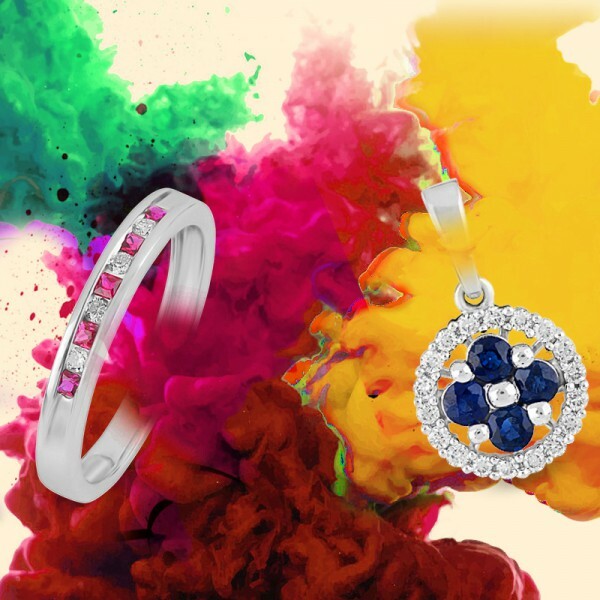 Adorned in sets like the colours of the rainbow, or set in precious metals set with diamonds and gemstones, each one a masterpiece in its own right, what is your reason to adorn these tinkling beauties today?